Matera Canvas Products were located at 5 Lispenard St. from 1970 to 1997. This is not, then, a particularly old sign. The founder was Pietro (later, Peter) Matera (1890-1971), a sailmaker who emigrated from Potenza, Italy, in 1914. The business was described as follows in Ward's Business Directory of U. S. Private and Public Companies, 1990: "Matera Canvas Products / 5 Lispenard St. / (212) 966-9783 / New York NY 10013 / Sales: 5.3 million / Employees: 5 / Founded 1907 / SIC(s): 2394 Canvas & Related Products. 5999 Miscellaneous Retail Stores Nec. / Description: Manufacturing, Retail: Canvas products / Officer(s): John Matera, Partner; Peter Matera, Partner"
This description of Matera Canvas appeared in the New York Times, 15 Feb. 1990, "If it is canvas you need, Matera Canvas has it: boat covers, tarpaulins, tote bags, awnings, aprons and items some people wouldn't think of making of canvas. Peter Matera, the third generation of his family to run the business, said his customers divide loft spaces by means of canvas curtains, make dropcloths to protect furniture during painting and use his canvas as a backdrop during photography sessions. His company also makes canvas floor covers for karate studios. ... 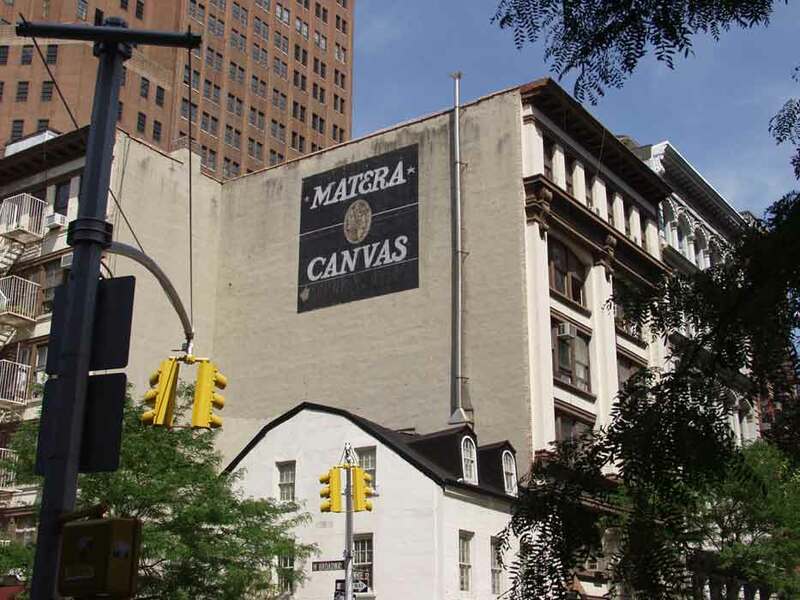 Founded in 1907, Matera Canvas is one block south of Canal Street on Lispenard Street. ..."
Some of the details in these accounts might be slightly misleading. Pietro Matera, for instance, registered for the World War I draft in 1917, age 26, born Craco, Potenza, Italy, 20 Nov. 1890. He gave his occupation as "Sail Maker, L. Martin, 44 South St., NYC." Matera, then, did not have his own business in 1917, but was working for one of the best known sail making companies in New York City, Louis Martin & Son, at 44 South St. Also, in the 1930 U. S. Census, Peter Matera, age 30, born Potenza, Italy, said that he emigrated from Italy in 1914. The first evidence of Matera's own business comes in 1940, when he was listed in the Manhattan telephone directory as "Matera Peter canvas covers 118 Warren St. Tel BArclay 7-8259." This business relocated to 5 Lispenard St. in 1970, where they stayed through 1997. Louis Martin & Son was a venerable company unto itself by the time Pietro Matera arrived in New York. Some of that company's history was told in this story from the Sarasota [Florida] Herald-Tribune, 19 June 1929, "A New Yorker at Large, by Deming Seymour. New York - When Henry Ahrens went to work on South street 30 years ago as a sailmaker's apprentice, the east side waterfront was a forest of masts. Sailing ships at anchor thrust their jib booms almost to the windows of the loft where Ahrens helped to cut and stitch canvas, and half the buildings along the South street from the Battery to Burling Slip were filled with sailmakers. Today a scant half dozen sailmakers are left on South street, and most of them are occupied less with sail making than with ship chandlery - the supplying of chains, rope, anchors and oakum to ocean vessels. ... The firm for which Ahrens started as an apprentice in 1899, and which he and a partner now own, has been making sails in South street between Old Slip and Governeur Lane since 1824. The old labor books for as far back as 1849 are still in the safe. The Chrystal family started the business, and in 1856, the ledgers show, a benchman's wage was $6 a week. A 13-year-old French sailor boy name Louis Martin ran away from his ship in the sixties and got a job with the Chrystals as apprentice. He became the owner of the business 20 years later and renamed the firm Louis Martin & Son. Martin died a dozen years ago. His son had already withdrawn from the business to become a real estate dealer in Greenwich Village. Today Ahrens and his partner still work with canvas, but sail making is a waning industry. Mostly they make tarpaulins for ocean vessels, barge covers for the harbor lighters and awnings for the cruiser yachts of such sailors as J. P. Morgan and Henry Ford. ..." This account is available on the internet at Google News. Predecessor to Louis Martin was John Chrystal (1819-1877). His life was summarized in History of Bergen and Passaic Counties, New Jersey, With Biographical Sketches of Many of Its Pioneers and Prominent Men, compiled under the supervision of W. Woodford Clayton, assisted by William Nelson, A.M., Philadelphia: Everts & Peck, 1882, pg. 120, "Thomas B. Chrystal. - His grandfather, Bernard Chrystal, was a native of New York City, and was prominently identified there as an officer of the State militia, and died about 1838, leaving four children, - John, Jane, Thomas, and Robert. The mother of these children died soon after her husband. John, son of Bernard Chrystal, was born in New York City in 1819. At the age of twelve, soon after the death of his father, being thrown upon his own resources for his support, he went to sea, and by his earnings not only supported himself, but contributed largely to the support of the other children. By his integrity and aptness for the duties on board a vessel he rapidly won his way to the highest official place, until for several years before he left the sea he was captain of a vessel and a popular mariner, whose many successful voyages to the East Indies and China made his name a proverb among shipping merchants. At the age of twenty-nine he married Catherine Bogardus, whose mother was Martha Cromwell, a lineal descendant of Oliver Cromwell, the Protector, who bore him children, - Martha J., Thomas B., John O., and Margaret. After the death of his wife he married her sister, Elizabeth F. Bogardus, by whom he had the following children: Joseph H., Catherine, William H., and Annie E. After his first marriage Mr. Chrystal settled in Brooklyn, N. Y., and began the manufacture of sails for ships in New York City. This business of sail-making he continued there successfully as long as he lived. In 1857 he removed to New Rochelle, N. Y., and in 1867 to Maywood, Bergen Co., N. J., where he resided until his death in May 1877." City directories indicate that John Chrystal's widow, Elizabeth F. Chrystal, continued the business during the 1880s. Successors to Louis Martin & Son were Henry Ahrens (1885-1962) and Charles A. Miller. According to championsailmakers.com, after World War II one of Henry Ahrens's sons opened Champion Sailmakers in Freeport, Long Island. In 1948 Henry Ahrens was in business at 220 West St., New York City. A year later, 1949, this business became John Matera, Canvas Products. This John Matera (1928-2009) seems to be Peter Matera's son, born Hillside, NJ, and his business at 220 West St. was listed in the Manhattan telephone directory from 1949 to 1952. His obituary in the Newark Star-Ledger, 31 Oct. 2009, mentions that he was the owner/operator of the Matera Management Company in Tribeca, Manhattan, but does not mention his involvement with canvas products.